A Prunus domestica L. cultivar. ‘Branches downy. Fruit middle-sized, nearly globular, swelling a little more on one side of the suture than on the other. Skin dark red, and when fully exposed to the sun, of a purplish colour, covered with a thin blue bloom. Flesh yellow, and separates clean from the stone, like an Apricot. Juice a little sugary, with a portion of astringency. Ripe the middle and end of August. The Orleans is one of our most common Plums, and known in every market throughout England.’ [George Lindley – Orchard Guide p.454/1831]. ‘The Orleans has been cultivated for more than two hundred years. Langley said of it in 1729 "The Orleans Plumb tho a common, is yet a very valuable Plumb, as well for its fine firm juicy Pulp when well ripened, as its being a constant and plentiful bearer." The Red Damask and the Brugnole mentioned by Quintinye in 1699 are probably the Orleans; but the Prune de Monsieur of Knoop and the Monsieur of Tournefort, which are yellow, are distinct. The variety is evidently of French origin. Mas in his Pomologie Generale, 1873, states that it first bore the name Brignole Violette, but later was given the name it now bears in honor of Monsieur, Duke of Orleans, brother of Louis XIV. Damas Rouge is an old synonym, though Duhamel described it as a distinct variety. Herrnpflaume is the common name of the Orleans in Germany and Austria, while in France, it is often called the Monsieur. It has never been common in America, yet it was entered on the American Pomological Society catalog list in 1875.’ [Plums of New York p.302]. Figured in Pomona Britannica [PB pl.XIV/1812]. A plum called ‘Common Orlean’ is the bottom fruit, with the ‘French Orlean’ centre right. They appear very similar and probably represent the variation expected of fruit propagated by seed. 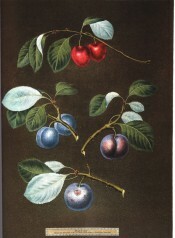 Listed in all published catalogues as ‘Orleans’ [Plum no.7/1843]. Prunus domestica ‘Orleans’ | PB pl.XIV/1812. The Common Orlean is the bottom plum, with the French Orlean centre right.